This has been on our list of ideas to share – this creative solution to a common problem is the result of lots of cross sector communication. Jeremiah’s Place is a brand new non-profit that is just opening in Pittsburgh. Jeremiah’s Place is what is referred to as a crisis nursery – a safe place that offers last minute child care to families that need help in an emergency situation. A woman wakes for a job interview and the phone rings. It’s the neighbor. She can’t watch the woman’s 2-year-old after all. The mother has no one else to ask. This is her first job interview in years. She becomes agitated. The child begins shrieking. In many cities, there’s at least one number the woman can call to arrange to leave her child so she doesn’t lose the job opportunity or worse, abuse the child in frustration. By mid-January, Jeremiah’s Place will be up and running as Pittsburgh’s first crisis nursery at the Kingsley Association in Larimer. In 2010, there were over 1500 reports of child abuse in Allegheny County, and 70% of abused children are under the age of 4. Over the past 10 years, more than 400 children have died as a result of child abuse in Pennsylvania. In addition, over the course of a year, 720 children in Allegheny County under the age of 6 experience homelessness and encounter a homeless shelter or program. However, these shelters are unable to provide care for children while the parents try to find jobs or new housing arrangements. Furthermore, in a survey of families in the East End, over 60% of caregivers indicated that they have trouble finding child care. Of these, 14% of caregivers admitted to leaving their children in high-risk situations and 9% of parents indicated that their child was hurt or had big behavioral problems after these situations. Jeremiah’s Place can meet these needs. There are lots of ways you can help Jeremiah’s Place get off the ground. 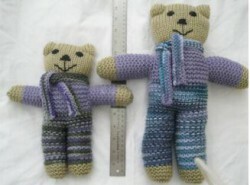 Knit a Comfort Bear – Most of the donated bears will be used in the comfort backpacks while some will be used to raise funds to support the crisis nursery. Run a 5k – Jeremiah’s Place 5K Run & Walk, Saturday 26 Apr 2014, 9:00 am at North Park Boat House. Volunteers Needed – Jeremiah’s Palce is looking for folks who have skills in Bookkeeping, Accounting, Law and Licensure and Business Development. Purchase items from the Jeremiah’s Place Target.com’s Baby Registry on Target.com. Buy a book for the Jeremiah’s Place library. See our list of desired titles. Shop Amazon.com – support Jeremiah’s Place by registering for and using smile.amazon.com. Jeremiah’s Place can receive 0.5% of the purchase price of items marked “Eligible for AmazonSmile donation.” Learn more here. You can make a financial contribution to Jeremiah’s Place online here. You can learn more about all of the volunteer opportunities on the Jeremiah’s Place website here. Follow Jeremiah’s Place on Facebook and on Twitter @JeremiahsPlace.